John White Painting is a high-end residential painting company that has been serving the Greater Omaha area since 1945 — that’s three generations. Over all those years, one aspect hasn’t changed: their commitment to quality, attention to detail, and uncompromising delivery of a fulfilling every customer service experience. In April of 2016 I met with David White of John White Painting to discuss a website project. The conversation soon turned to brand strategy and how we could develop David’s vision for the future of the company. While the name John White Painting was well-known and respected, they had experimented with very little advertising over the years and had yet to develop any brand collateral. David expressed interest in creating a look and feel that would bring the brand that existed in his visions to live. Establishing guidelines around how a brand is communicated to the world ensures that certain standards are being met with every piece of communication we deliver. We worked with John White Painting to create a color and typography palette to be implemented across all of the design pieces to come, ensuring a cohesive look and feel. David loves all things hand-crafted and vintage, so we went with a very retro-inspired tangerine and sea mist green as the brand’s primary colors. Cleanliness is important to the brand, so we also decided to incorporate a lot of white space to give the collateral a very clean feel. At the beginning of our relationship, John White Painting’s most pressing need was a logo emblem that would portray the richness of their history and tell their story. In our discussions, David presented me with the original seal his grandfather would use in letters. I loved it, as did he, and we decided to bring it back to life. For the new logo, we would take the original David White Painting seal and recreate it by hand, keeping the essence of nostalgia and tradition and digitizing it for multiple uses including your website, social media profiles, letterhead, and merchandise. Another building block was to begin to create an online presence and enhance search engine optimization. We created a Facebook page and claimed their Google listing. There were some old addresses out on the web, so we corrected those and made sure the contact information was all up to date. We launched a modern look and feel and had a training on page features, best practices, and analytics. With this great new presence and all this great new material, it was time to focus on getting the word out. At the time, the company hadn’t been utilizing email as a way to communicate with their customers. We gathered the email addresses and created a MailChimp account that would serve as the database to house the emails. In addition, we designed an branded email template and got to work on creating an initial message to send out. Google’s G-Suite allows organizations to have professional email addresses and provides access to seamless team collaboration tools, secure online cloud storage, shared calendars, video meetings and more. We set up the dashboard and email accounts for John White Painting and trained staff on how to use all of the tools and capabilities the system has to offer. And because Say Hey There is a G-Suite partner, they were able to score 20% off their first year! John White Painting has these cool, clean-looking white vans that were ready-canvases for some fun branding! We designed van wraps to have professionally installed that would include the logo, splash of color, and important contact information. There are so many fun ways to show off a new logo. One such ways that David and John were excited about was to create new work shirts. Check ’em out! The final piece was to visit their shop and take photos of the van wraps, new shirts, and father-son-duo to use on the website! *Special thanks to Karli Davis with Salted Paper Photography! “For nearly 70 years, our company grew almost exclusively through our solid reputation in the construction community, and through word-of-mouth from clients and general contractors. But, in 2015, we recognized that attitudes toward contracting firms, and how potential clients and general contractors find and vet them, was changing. We needed to be forward thinking in how homeowners and construction firms were going to look for painters in the future if we wanted to remain competitive. I knew we needed more than a website, however. We needed a suite of services that established our online presence and was consistent across our entire platform, from the website to emails, to stationery, and other peripheral brand items–something that matched the quality of work our clients expect of our painting services. 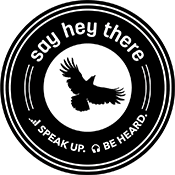 © 2018 Say Hey There LLC / Speak Up. Be Heard.